The Arc’teryx brand is one of the most trusted brands for jackets and outerwear. The brand offers a unique and innovative design in each of the products that it produces. One of the more popular products that are superior in quality is the Arc’teryx Therme Parka. This is one of the newest parka designs. It is a design that has quickly gained popularity for its features and style. The perfect combination of weather resistance, warmth, durability, and other interesting features provides the jacket with an edge over its competition. I really was excited to check out this jacket and it did not disappoint. 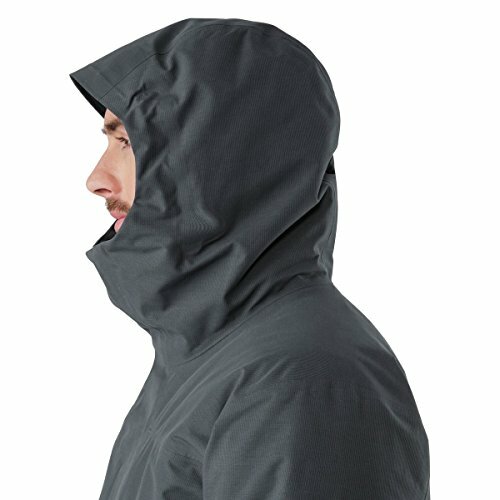 I honestly have been so stoked on the Arc’teryx Therme parka and want to share my experience with you. In fact, some consumer websites have offered this jacket awards. It was rated as one of the best jackets for overall performance. The Arc’teryx Therme Parka has an innovative design and is one of the newest parkas available. For me personally, this jacket has become an instant favorite. I love wearing it and love that it looks as good as it protects. The jacket is very warm and you never have to worry about being cold when you are wearing it. Plus, it is water resistant and weather resistant. This means that you will not have to worry about gnarly weather conditions when you want to get out of the house. How Well Does the Arc’teryx Therme Parka Perform? What is the level of Warmth? Can You Explain the Weather Resistance of the Therme Parka? How Comfortable is this Jacket? The Arc’teryx Therme parka is the ideal parka. If you want a parka that is going to meet all of your needs, this is the one that you should get. This is a great jacket that is perfect for the winter conditions for a number of reasons. The first of these is that the parka is waterproof and that it can keep you dry in the rain or snow. The second is that it is warm and helps you to keep your body temperature higher when you are out in the winter weather conditions. Third, the Therme parka is comfortable and allows you to have freedom of movement while you are wearing it. Finally, the parka looks nice when you are wearing it. It does not look sloppy or uncomfortable as many winter parkas do. Instead, it looks trim and slim and offers a style that most other parkas cannot compare with. Of course, you might be trying to figure out what all the Therme has to offer you. This parka is relatively lightweight and weighs just 2 lbs and 5.6 ounces. It features a superior design for the winter weather conditions. The outer shell is made with a Gore-Tex 2L75 Denier. This has a soft feel and is textured. In addition, the storm flaps that are featured over the zippers work well and keep you dry, even in the worst conditions. In addition, the hood is perfect for when you would like to wear a helmet and allows for you to easily be able to see while you are moving with it on. The parka is thigh length and this helps to keep more of you protected in adverse conditions. Of course, there are other pieces of information that you should know about the parka. One of the things that I am often asked when I am done with a review from others is whether or not I find the item to be valuable. To me, a good value is something that is not going to cost a fortune and is going to last longer than you would expect for the price tag. This jacket costs quite a bit and is something that I would highly recommend still because I felt that the value was good. You are not going to have to worry about the parka losing its luster or looking old. In fact, the one that I tested still appears to be brand new even though I put it through some abuse to see how durable it was. In addition, the jacket is one that I am sure is going to last for years. Any Arc’teryx product that I have purchased has been a contender for lasting long and durability and I am completely sure that this is not a problem. Performance of any jacket is the most important factor. Obviously, if you are looking to protect yourself from winter conditions, you want something that is actually going to do its job and protect you well. The following questions are all of the ones that you might ask when considering the performance of your parka. The Arc’teryx is a very warm full-length parka that offers you more than what other similar jackets have to offer. In fact, one of the things that makes this parka unique is that it is completely filled with down insulation. The insulation is featured throughout the body. Arc’teryx uses a 750 fill goose down in the Therme. The 750 fill can be found in the areas where you do not see the most moisture like the core and sleeves. However, this is not the same insulation that is used in areas that are more prone to moisture. In those areas, like the underarms, hood, and cuffs; there is the Coreloft synthetic insulation. Coreloft synthetic insulation is water resistant. This allows for it to offer maximum performance even when the conditions equate to having a damp jacket. In addition to this, it is important to make mention of some of the things that I noticed about the sleeves. One thing that I have noticed with some jackets is that while my core stays nice and toasty, my arms seem to be very cold and I have a hard time keeping them warm while I am out in the cold. 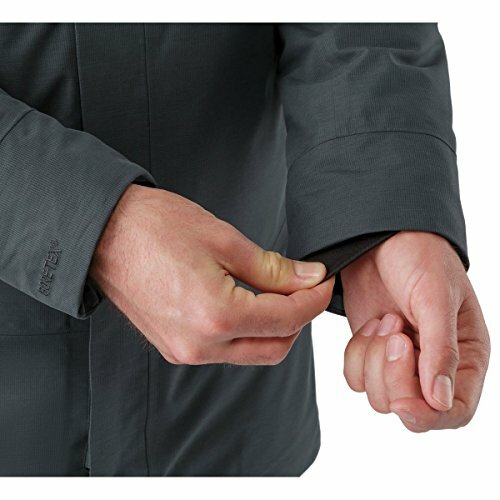 The sleeves on this parka are insulated fully and have special features around the wrist that help to prevent the loss of heat that might be experienced with another parka. The pockets are not insulated. I found this fact to be a little disappointing as I hate being cold and want to be assured when I purchase a jacket that everything is going to keep me warmer. The pockets are lined in the same fabric that lines the outer shells. This fabric is unique and it feels smooth and textured, never clammy. One of the things that I liked the best about this jacket is that while the outer shell really helped to lock in the heat, it also allowed for the jacket to be breathable. Never again do you have to worry about sweating inside your jacket while you are freezing without it. Thanks to the breathable nature of the fabrics, you never have those problems. The Arc’teryx Therme parka was a nice lightweight choice that allowed for us to be able to travel and move around freely as we wore it. The Arc’teryx Therme parka is a great jacket that you are going to want to consider if you are looking for something that is weather resistant. One of the things that can be really annoying in bad weather with down products is having to worry about whether or not the frail feathers get wet. This can cause them to lose their ability to insulate as wet features clump together and do not work right. Sadly if this happens with your down jacket, you might find that the overall insulation is compromised. This can cause you to have more moisture problems as the moisture traditionally spreads in this situation. Instead of causing you to have this problem, Arc’teryx takes things a step further and introduces some interesting technology into the parka. They use a system of mapping that actually helps to pinpoint those areas that traditionally get more moisture. Then they use a special additional synthetic insulation in those areas as well as the traditional goose down. This allows them to prepare for areas that might have high moisture without having to do anything except add some special insulation in those areas. This keeps the jacket management in storms and helps to prevent any moisture from causing problems with the down filling. Plus, you never have to worry about getting wet in the jacket. Now, you might be wondering what this will do for you. Of course, if you are wearing this jacket, it is very unlikely that you are going to be wet. The outer shell offers a special 2-layer Gore-Tex material. One of the things the brand offers that many other brands do not is that they have small seams that are taped. This helps to ensure that all of the seams are waterproof and that this never leads to an issue. This helps to ensure that the jacket stays light as well and that it is easier to move around in. All of these things are things that you will want to take into consideration as you are looking at the Therme parka. You might want to note that the biggest improvement with these tiny taped seams is that the jacket feels like it is just one piece of nylon and that you honestly do not notice the seams. They are not heavy and stiff like the seams in some jackets. There are some other features that will help things to stay waterproof as well. This is one of my personal favorite things about the parka. There was so much detail put into the jacket to ensure that I would stay dry. 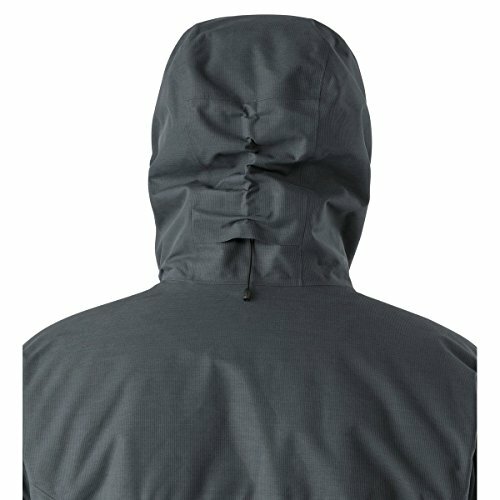 One of the things that helped improve the jacket and keep it waterproof was the fact that there are large snaps used on the hood and at the bottom of zippers. These both helped you if you were caught in the rain or a bad snowstorm as they helped to keep you dry. However, both of these were not necessary when the conditions were not wet. The hood also has a special brim that was designed to keep more rain away from your face. The stretchy liner on the inside of the cuffs that are sewn to the sleeves helps prevent moisture (and even air!) from getting inside. The only disappointing thing with the cuffs is that they didn’t cinch as most other jackets offer. 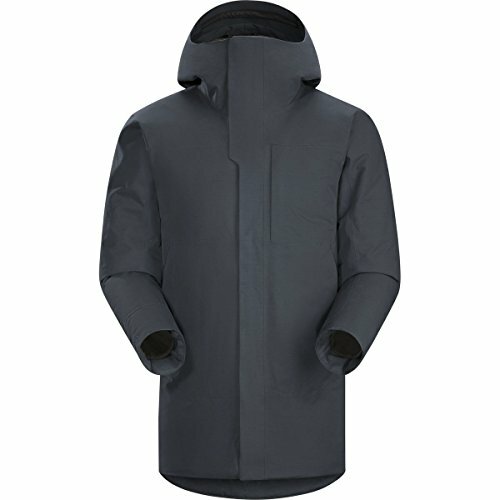 The Arc’teryx Therme Parka has a unique and comfortable structure that you are not going to find in other winter parkas. I really feel that this jacket is unique because the shell fabric is so comfortable. Now, this might not matter to you because you are not really going to have skin to fabric contact with the shell frequently (or really at all), but there are some perks that we discovered and wanted to share with you. One of the things that we noticed is that when we were active and moving around a lot, you do get some skin to cuff contact and other areas where your skin rubs the jacket. With the Therme, we never had weird sores or marks on our skin because the fabric was so comfortable. This was not the case with some more traditional parkas. One of the things that I hate about traditional rain jackets is the sound that they make while you are walking. That constant swishing is super annoying to me and I hate the feeling of the crinkling nylon. This is something that you will never have to experience again with this parka. There is no swishing or crinkling no matter where you go or what you are doing. One of the things that I really appreciated was that when my sleeves moved across my body, it was silent. This is not something that I have often been able to experience while wearing a coat. Of course, you are probably wondering how this is going to affect you. This coat is never going to feel bulky. This was one of the first things that we noted because it simply did not fit or feel like the traditional down jackets that we were used to. We never felt bulky or big in this coat because it was smooth and trim. I personally loved that I was able to move around when I would walk into a store or ski shop without worrying about my jacket knocking something off in small spaces. The Arc’teryx Therme parka is a classic jacket and one that is not going to be out of style anytime soon. It has a number of features that are vital to the overall quality of the jacket. One of the things that many people do not think about with the Therme are the features because they are not flashy and are often subdued. These are just a highlight of the top features of the jacket. The jacket features mapped insulation that you can not see. The stitching on the jacket is ergonomic and moves with the body. The jacket has a cinch cord for the hood that is stored in the back of the hood and is out of sight. 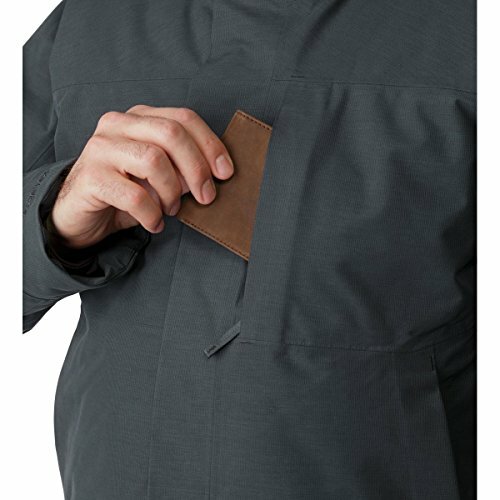 The parka features two large hand pockets, one chest pocket, and one Napoleon pocket. There is a fleece lining around the neck and other wrists of the jacket to ensure that you are always comfortable. However, there were some features that we felt were missing from the jacket as well. The jacket did not have hand pockets that were insulated and we felt that this was a huge miss. Plus, there were no vent zippers or other features to ensure that pieces could be removed and reattached without causing issues. Perhaps these were left off because they would have ruined the overall look and design of the parka. Also, the parka cannot be stuffed into a stuff sack or folded into one of its’ pockets. This is simply because it is not the type of jacket that has been made to be stuffed. I do realize that each person has their own unique and individual style. This is something that I really appreciate when it comes to jackets and parkas alike. One of these is that this jacket has very clean lines. This is very nice for being able to make sure that the jacket looks good when you are in different environments and situations. Likewise, the outer lining of this jacket has a smooth and clean look. There are many other jackets on the market today that do not have this same simplistic design. In fact, many of these have extra details like zippers and snaps everywhere. The pockets even lay flat without flaps or other noticeable design elements. The colors that the Therme is available in are neutral and traditional. There is a woven fabric that reflects the color in different hues and offers more depth, but this not noticeable unless you are really looking closely at the jacket. This will actually resemble more of a twill material than the traditional nylon that you are probably picturing in your mind if you have not seen one of these parkas up close. In addition, you will want to note that the fabric is covered with the popular and effective Gore-Tex membrane. This membrane offers high levels of protection against the wind and elements. Plus, the jacket has a combination of insulation including synthetic and down. This jacket looks very different from your traditional winter wear, but the performance and adjustments make it one of the top contenders to keep you warm all winter long. One of the things that I love most about Arc’teryx is that they have pushed the boundaries in looks and what you get with one of their pieces is never what you’d expect. In the future, you might find that the company will expand its wings and test out some additional colors that would be considered more fun, or you might not. Regardless of what you think, you are able to find everything that you are looking for in this jacket and that makes it more exciting. 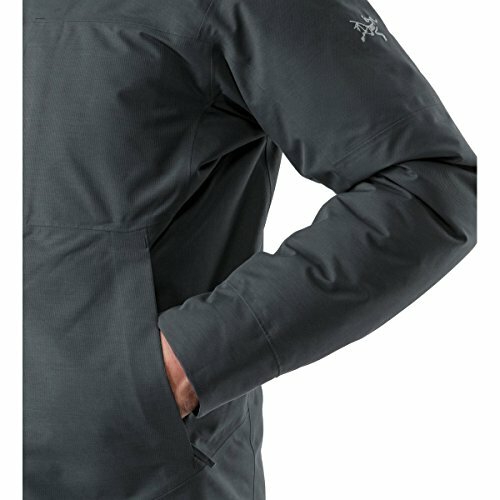 The Arc’teryx Therme parka is one of the jackets that we put through the ringer when we were testing it. We decided to try it out on a wide range of different types of terrains. We tried it in the mountains where we were exposed to rock and snow that was both dry powder snow and wet snow. We tested it in the thunderstorms in the midwest, and we tested it completely in the cold nights of the desert. No matter where we went and what we put the Therme through, it came out shining bring and holding strong. I will admit that I am not a careful skier. In fact, when I was skiing, I felt a few times and ran through some underbrush. I also ran into a few tree branches, had a rather unfortunate experience with a snow lift, and spent time cuddled close to the fire in the lodge. The jacket never once showed any wear and tear during those activities. Likewise, when I was not wearing it, I might have carelessly tossed it in the trunk or on the floorboard and it still came out looking new. I am hard on things on my own, but when I am reviewing a product and want to test durability, I am even harder. I did worry that the snaps might pull out since I often ripped the jacket and off and pulled on the snaps harder than I should probably admit to. However, there has not been an issue yet and I have been using this one quite a bit. The only area that I feel would tear up easily is the cuffs around the wrists. These cuffs are made from fabric and they were caught on things when I was going through my adventure. At this time, I have not noticed any wear or tear which surprises me since I had to unhook them at least two or three times. So, while I think that they could be damaged more easily there is nothing to prove that this thought will become reality. Not have insulation or fleece lining in the pockets. One of the things that I noticed when I went shopping for this parka was that there was quite a bit of difference in the older version and the current version. I like to make note of this when I see it because often times you might consider buying an older version if you do not have the financial means to buy the new one. The new version of the Arc’teryx Therme Parka is actually being marketed under the name Camosun Parka. The Camosun Parka retails for $675. The Therme Parka retails for $695 (Check out the latest rates here!). Of course, they are both available to you in a few color varieties but both are limited. Arc’teryx did attempt to answer the questions about the differences between these two parkas when they released the Camosun. Their website states: “The Camosun Parka is slightly shorter and easier to wear for me. 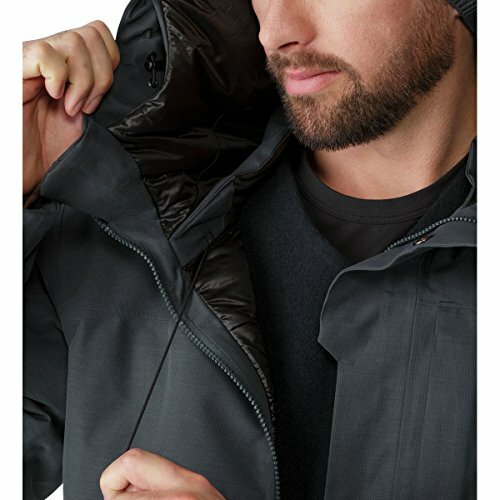 It now has a detachable hood, new face fabric that is more masculine, and is constructed of a slightly harder fabric (not the same as on the women’s Patera Parka which is softer to the touch).” And more convenient to wear for men. So, they were willing to quickly outline for you what is different and what you need to know as you make your personal decision about what parka is going to be right for you. It provides a higher warmth level than what many other parkas offer. The parka is weather resistant and in most conditions, you are not going to be affected when you are wearing this jacket. The parka is stylish and fits well. The Arc’teryx Therme parka is truly perfect to wear at any time. You can wear this comfortable and easy to move in the jacket when you are walking your dog or actively sledding with your children. The jacket is nice looking and will fit in no matter where you are at. So, if you are going to a local cafe for some coffee or out for dinner and drinks this is a good choice to wear there as well. Even if you are working hard with a snow plow or doing other labor-intensive work, you will find that this jacket holds up and looks brand new the entire time. In fact, I would personally just suggest that the Therme be your main jacket from November to March and that you take it with you no matter where you are going. Our experts read through thousands of customer reviews to get you all the necessary information about washing and maintaining Arc’teryx Therme Parka. Do not use fabric softener on the jacket. Machine wash in lukewarm water (30 degrees). If possible, use a front load washing machine. In case you have a top-load washing machine, make sure you use a mesh bag. Dry on the low heat setting. Do not iron the jacket. Now that you know everything about Arc’teryx Therme Parkaand its key features, do you think it matches your requirements? Well, our experts found the winter jacket very comfortable and useful and have rated it high among several other winter jackets on the market such as the North Face Gotham and Patagonia’s Roy’s Bay. And, if you’re shorter, and feel that the thigh-length jacket won’t go well with your height, don’t worry; we have experts as short as 5’1” on our team, and they found Therme Parka stylish and elegant. There are many final thoughts that I would like to share with you. First off, I really do love my Arc’teryx Therme Parka Men’s (Black, Large)Arc’teryx Therme Parka. This jacket has become a favorite of mine because it offers so much. I love how it looks both on and off. When I am wearing it, I feel confident. I know that I am not overly puffy and that I am not going to blindly run into things because my coat is too baggy. However, I can still fit base layers and mid-layers underneath this parka when I am going to be outdoors for long. I also love that this jacket fits with other Arc’teryx products to ensure that you stay warm and comfortable in a variety of different situations including outdoor sports in the brutal cold. This jacket is a really great value. I put mine through a high level of abuse and it still looks very nice. I am really glad that I chose this jacket because I know that I am going to have it for a long time. I also know that It is not going to look like I’ve had it a long time which I prefer. As someone who always puts a lot of effort into trying out products in their natural environment, I can say wholeheartedly that this parka is one of the best ski parkas that I have ever tried out. This jacket is one that I would highly recommend and I can actually see myself purchasing a newer one in a few years when this one needs to be replaced. This is mainly because even after a few rough runs on the skis, this jacket did not have any areas that were leaking feathers. In conclusion, you’d be doing yourself a favor if you bought this jacket. This jacket is awesome for protection against the elements and will keep you looking fresh the whole time! We hope you found the Arc’teryx Therme Parka review useful. If you have more questions about the jacket, please post them in the ‘comment section’ below, and we’ll quickly get you the answers. Also, if you’d like us to review or compare any other outdoor gear, let us know, and we’ll forward your request to our experts.